Promotional ice buckets decorated with your advertising message make a statement at events. 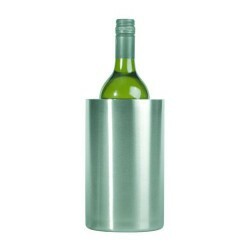 Unique promo merchandise such as these printed wine buckets are always a smart choice for improving brand recognition and recall. They are undeniably distinct and practical, which is why customers always love receiving them as a business gift. 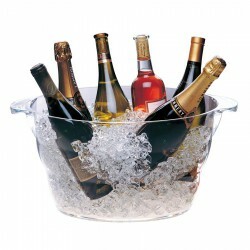 Here at Promotional Product Experts, our collection of branded ice buckets features diverse choices. We have the personalised ice cooler which can hold a single bottle as well as a printed party tub for keeping several bottles cool. Made from quality acrylic, stainless steel or plastic material, these best value custom wine buckets can be customised with your corporate name or logo. *This large acrylic tub is the perfect item to keep multiple bottles cool for entertaining. *Features: Useful hamper gift to fill the tub with all your favourite items. Wine Bottles not included. Inner liner BPA free Bucket & lid galvinized iron, Stainless steel bottle opener, Insulated cooler bucket inside Bottle opener hangs on the side. Gel ice bag, Slides into the D837 wine coat to keep drinks cool.